Last night, I finally had time to sit down and explore my new Essential Geography of the United States of America map. Produced by Imus Geographics, the Essential Geography map is designed to bring out basic geography of the country, and is different than traditional maps in several ways. I got the folding version of the map, and when it is unfolded, it is huge—53” x 35.3”. I settled down with the map for about an hour last night, and the amount I discovered about the country that I didn’t already know was astonishing. Here are 5 of them. Three Mile Island is in Pennsylvania! For some reason, I thought that Three Mile Island was in New Jersey or New York. Perhaps I confused it with Fire Island. But as I browsed the map, I spotted it, right there not far from Hersey. The highest point in Florida. Anyone driving through Florida can’t miss the utter flatness of the state. The Essential Geography map includes the high point in every state, so I searched Florida until I came across Britton Hill in the panhandle. At an altitude of 345 feet, Britton Hill is only about two-thirds the height of the Washington Monument. Here’s another tidbit I learned. The old Route 66 begins in Chicago. For some reason, I thought it spanned the entire country, from east coast to west. Perhaps I was confused by I-66 which is the toll road that goes into and out of Washington, D.C.
Idaho has some strange time zone boundaries. 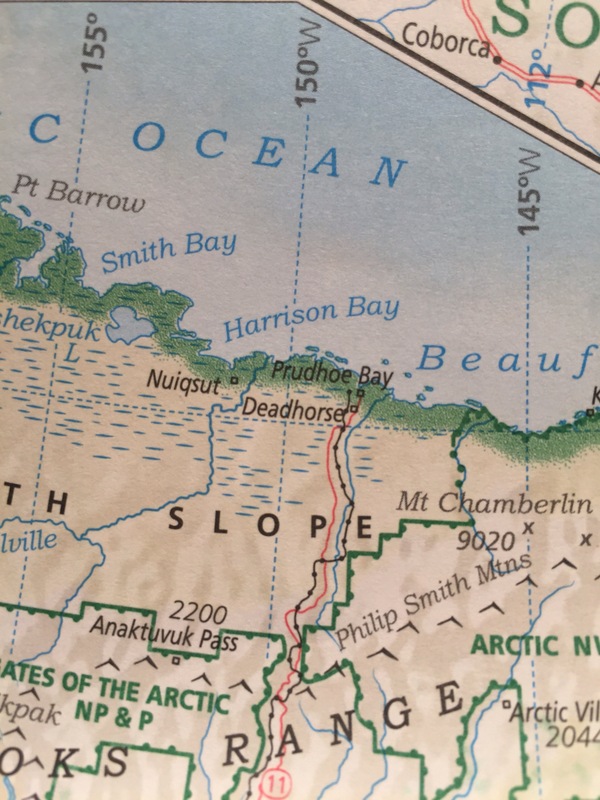 What I’ve always through of as “Purdo Bay” Alaska is actually Prudhoe Bay. I feel like an idiot for referring to it as Purdo Bay as many times as I have. I can’t wait to spend more time pouring over this map, and discover more things bout the geography of the country that I don’t already know.